We’re not sure there’s a better name for a band than Worry Dolls if you want to soundtrack events in both the US and UK… okay, there’s a few, but Worry Dolls is the only one you can say uncensored. It’s also the name of a marvellous duo, Zoe Nicol and Rosie Jones. Both talented multi-instrumentalists and singers who harmonise brilliantly, they met at Liverpool when they were studying music and first worked together as part of an initiative involving Paul McCartney. 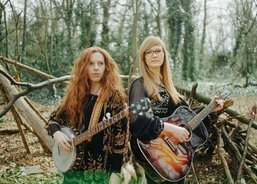 Whatever else came from that programme, we got Worry Dolls as the pair decided to continue writing together, left college as a duo and have toured both as a pair and with a backing band. A debut album followed in 2017, ‘Go Get Gone’ on Bread and Butter.